When you visit an area as frequently as we visit the Yorkshire Dales it is easy to repeat a walk that was done not so long ago. 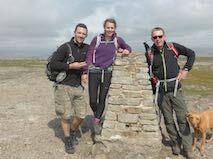 So today we are repeating a walk last completed in June of last year. Part of me thinks it a bit lazy not exploring a new area, but covering the same ground once or twice a year seems acceptable. In any case we are starting at a different spot and extending the route by a few miles. Blog followers may remember that I like to fit in some walks directly from the caravan site leaving the car behind for a day. This is one of those walks. 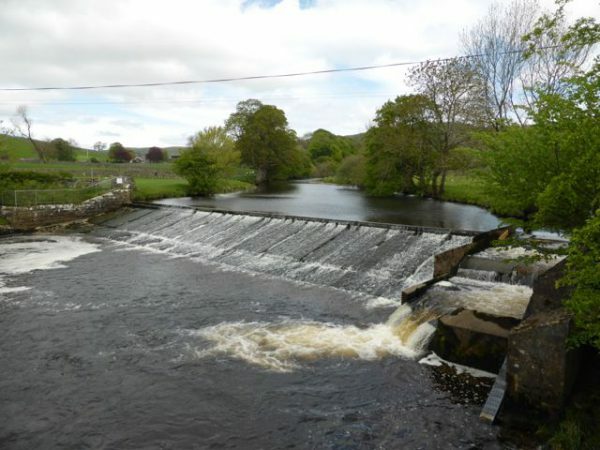 From our site in Langcliffe we turn right and walk down the footpath towards Langcliffe Paper Mill. 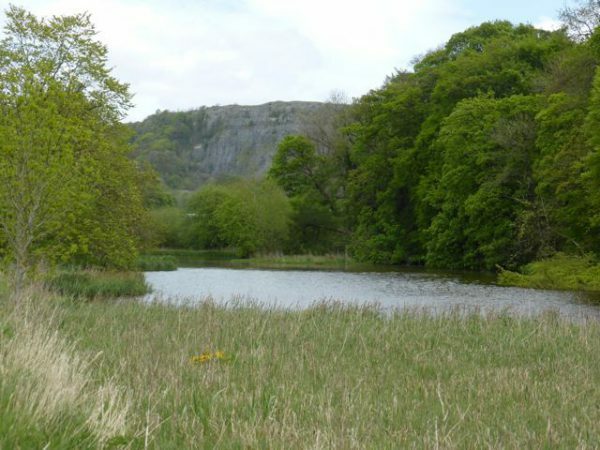 Quickly emerging alongside the mill pond, a very tranquil spot we have not visited previously, in the distance we can see the old Langcliffe Quarry. Crossing the River Ribble we stop for a moment to admire the weir. 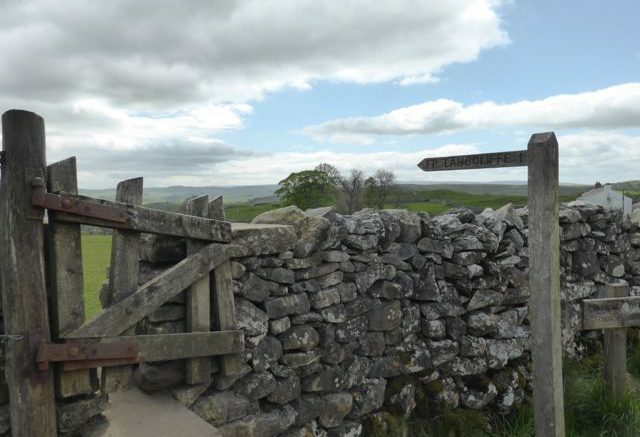 On the other side we have two choices, to follow the footpath alongside the river bank towards Stainforth Force, or to walk up to the road and to Little Stainforth. Lynnie recalls our previous encounter with bears last year on the footpath by the river, so that route is quickly ruled out! Therefore we continue straight ahead until we reach Stainforth Lane and turn right. I am not usually keen to walk along roads, but this is a very quiet lane and benefits from cracking views across the valley. 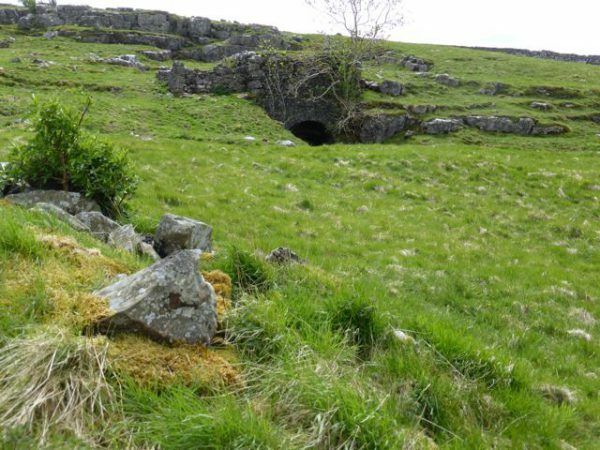 At Little Stainforth we arrive at a crossroads of paths and briefly contemplate a left turn to take the Dales High Way towards Feizor, a chap is coming down that path and we briefly discuss the route with him to find that there are bears on the top. He then recounts a scary encounter with bears on the same path earlier in the year. Our mind is made up, we turn right down the lane to Stainforth Force and over the old packhorse bridge and then up to Stainforth. 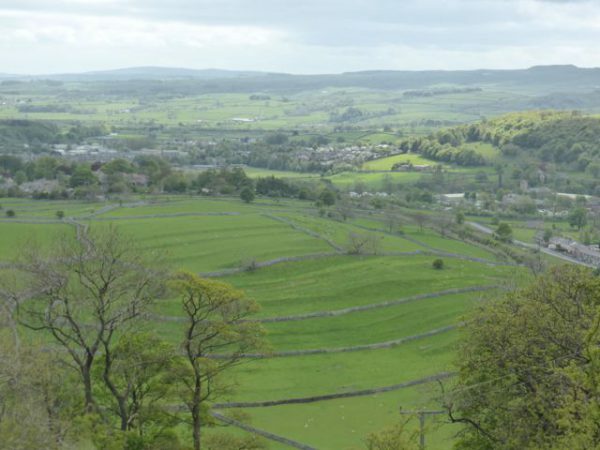 Stainforth is a pretty Dales’ village, we wander through admiring gardens and vegetable plots. Part of the fun of wandering around is to see how other people approach gardening. After last year’s tour returning to our home on a semi-permanent basis we have both spent hours in our garden. 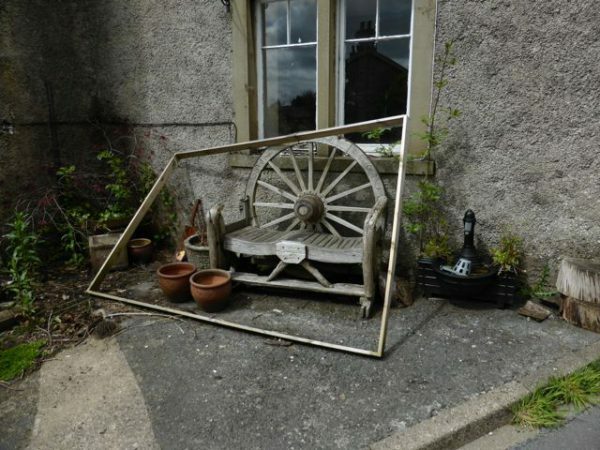 So we are always looking for new ideas and thoughts for additions to the garden. 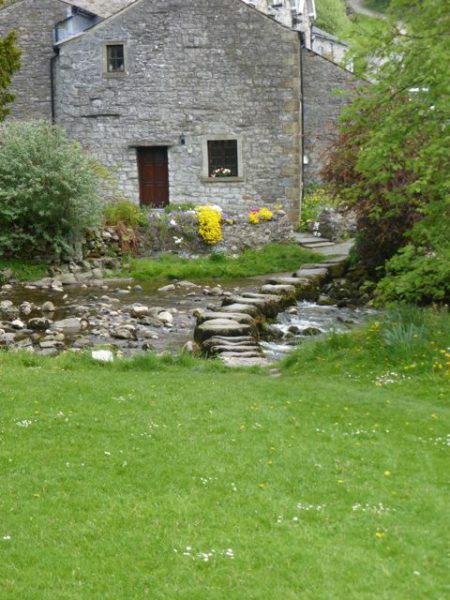 Once through the village we arrive at the stepping-stones crossing Stainforth Beck. A quick risk assessment suggests that there is every possibility that trying to cross here with the dogs will end up with me (assisted by the dogs) in the water. We take the short detour back into the village passing the Craven Heifer pub and turn left to follow the lane round by the village green. Up the lane and before it turns into a well-worn track we stop on a bench for a picnic and admire the view. Lynnie starts to count the number of wild flowers and grasses on this small patch of grass. There are hundreds. 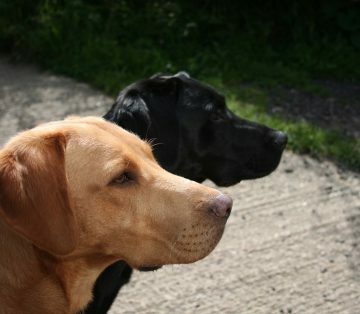 Meanwhile Crosby and Dexter explore the area to seek out picnic crumbs from previous occupants of this spot. The walk upwards is steep, but rewarding. Half way up I spy a lime kiln over the wall. I have walked this track several times before and missed it. Readers will know that Freddy’s do like a lime kiln. At the top we avoid the temptation to visit Catrigg Force, the dry weather means low river levels so what can be an impressive sight might be a disappointment. Through the gate there is a choice of paths, we take the one to the right. Crossing the field and through the gate on the far side we take the path signed towards Winskill Farm. Before the farmyard we turn left down a track towards Lower Winskill and climb a wall stile. Last June this was an attractive meadow of wild flowers, but being a few weeks earlier they are not yet in full bloom. Across another couple of fields we pass another disused lime kiln and then go through a gate to descend steeply by the side of Langcliffe Quarry. The views from here are cracking. After another couple of fields we follow a walled track into Langcliffe. In the village we turn left up the road and just past the old school take a footpath on the right that climbs steeply before swinging right to head through a couple of fields to Settle. 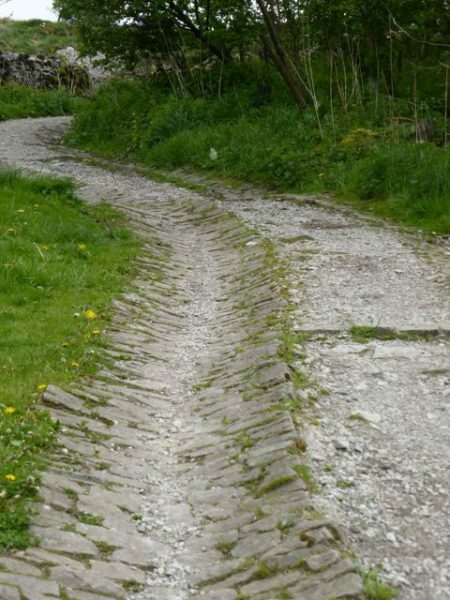 From Settle we follow the pavement to take us back to our site at Langcliffe Park. A cracking wander that sets us up well for an evening out at the Little House restaurant in Settle with our special friends Maurice, Jane and Carlos. It is a special occasion today is Maurice’s 90th birthday. Lynnie’s First Ice Cream Of The Season!